The myths surrounding the adoption of the Magnitsky Act feverishly formulated by the head of Hermitage Capital as well as those they hired for informational assistance to spread this story inside Russia among various opposition figures, including Alexey Navally, imply the existence of an honest and heartfelt sense of pity for Russia on the part of American congressmen. However, an examination stopping at Mr. Browder’s lobbyist schemes would be simply unforgivable, especially from the point of view of the interests of Russian society which deserves to know who exactly stands behind the anti-Russian hysteria in the West. Therefore, today we present to the court of the respected public the second part of the investigation on the secret springs behind the US Congress’ “Magnitsky Act.” And the main character in our investigation is played by Mikhail Khodorkovsky. As is known, the peak of Mikhail Khodorkovsky’s wealth and power was in 2003 when his fortune was estimated at $15 billion. 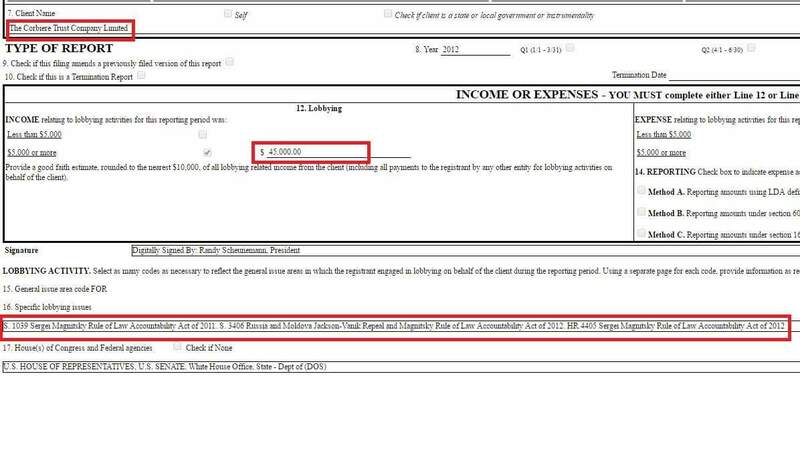 However, despite substantial time spent in different places deprived of liberty and formally distancing himself from the business sphere, in 2016 Khodorkovsky still ended up in the annual rating of Russian millionaires with capital valued at $500 million. 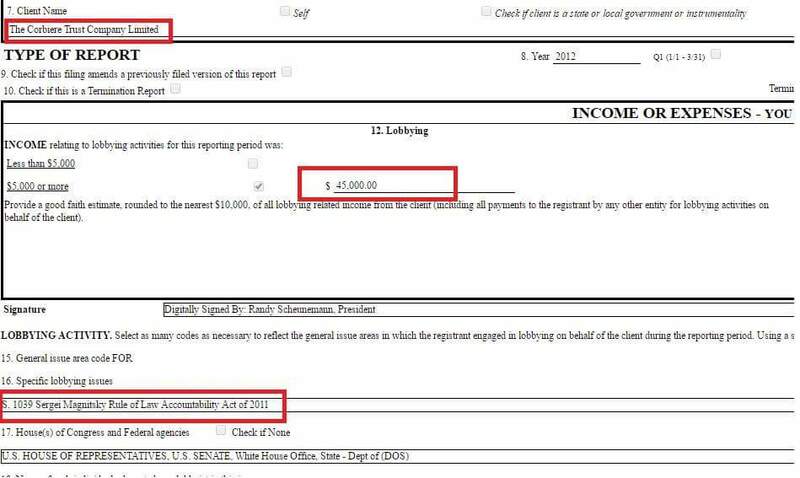 As it turns out, Khodorkovsky is the main private investor and co-owner of the company Quandrum Global. Quandrum Global manages the Quadric Atlantic SPC foundation among the co-owners of which six trusts from Guernsey island have been pointed out by the Miami Beach administration. 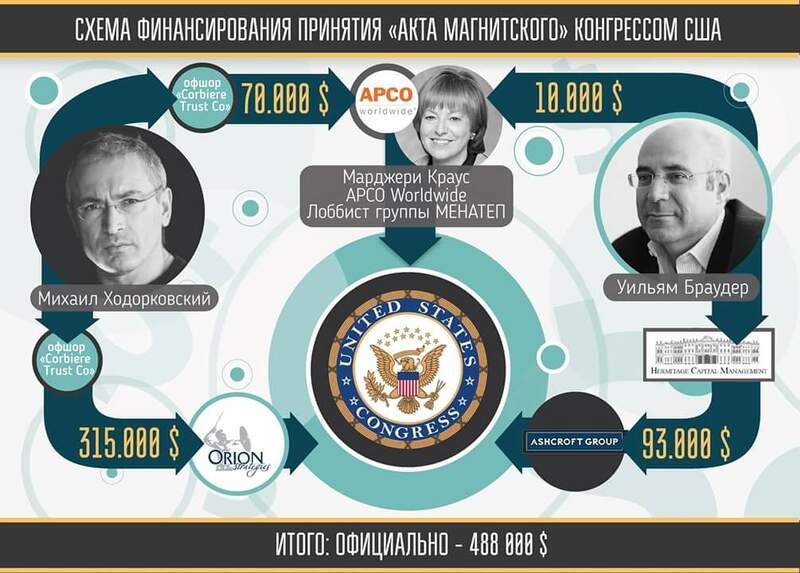 Among their beneficiaries figure, in addition to Khodorkovsky himself (Corbiere Trust), his former Yukos partners Platon Lebedev (Mensa Trust), Vladimir Dubov (Draco Trust and Dolphin Trust) and Mikhail Brudno (Aquarius Trust and Auriga Trust). They also appear on the Forbes rating with similar fortunes. But the most interesting comes later. 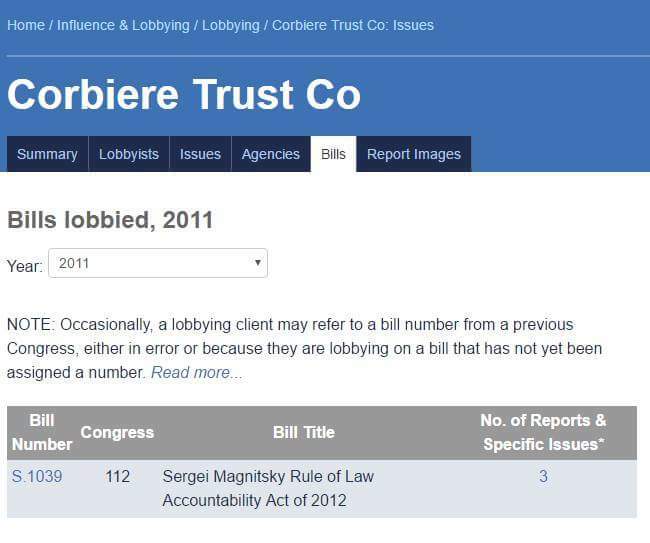 A search through open source information reveals that the offshore company Corbiere Trust is controlled by Mikhail Khodorkovsky and in 2011-2012 actively participated in lobbying for Congress’ adoption of the Magnitsky Act. 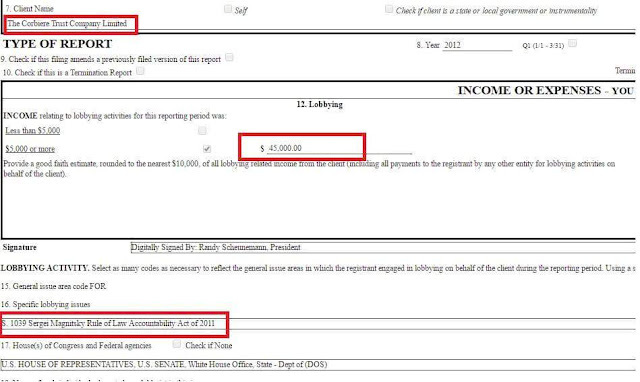 In addition to the fact that Mrs. Kraus is part of the leadership structures directly linked to the Khodorkovsky family, she has also been doing the PR support for Yukos in Washington since 2003, and has even joined the International Advisory Board of the MENATEP group. 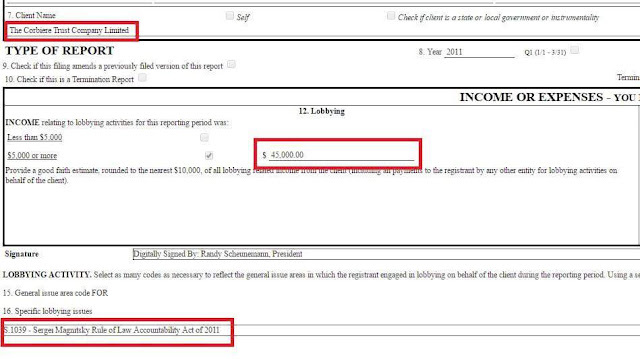 It should be noted that over time the dumping of funds from the offshore company controlled by Mikhail Khodorkovsky for lobbying the Magnitsky Act has only intensified. In 2012, the same Orion Strategies company received 4 payments of $45,000 each from Corbiere Trust all for the purpose of supporting the Magnitsky Act. What conclusions can be drawn from the above-mentioned facts and the first part of our investigation mentioned earlier? 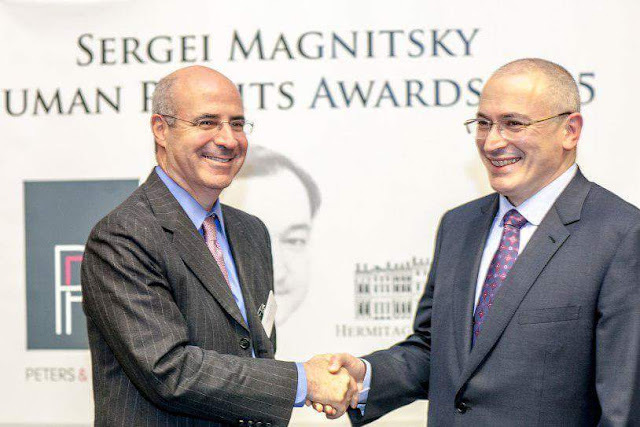 The lobbying scheme behind the Magnitsky Act has been revealed, as it turns out, to be promoted not only by William Browder, but also Mikhail Khodorkovsky directly himself. 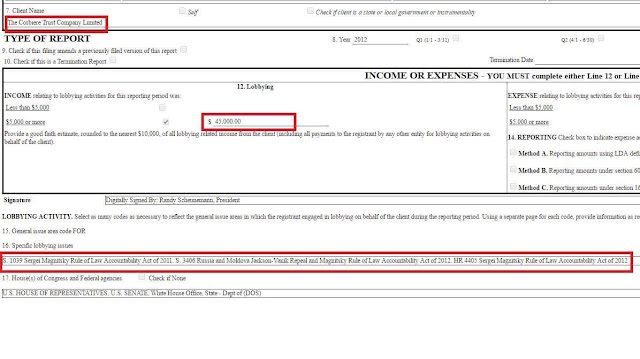 Sergei Magnitsky is no jurist, but an accountant and an auditor, who started to testify against his employer (Browder). 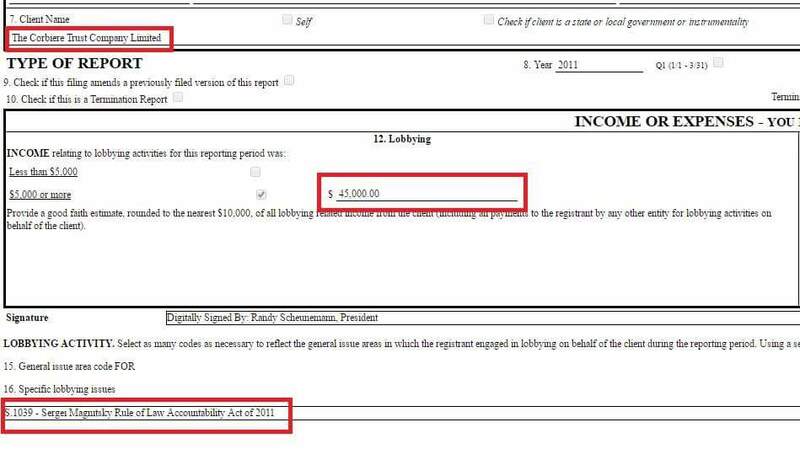 And thus arises the question of who in fact would benefit from the death of the accountant Magnitsky. 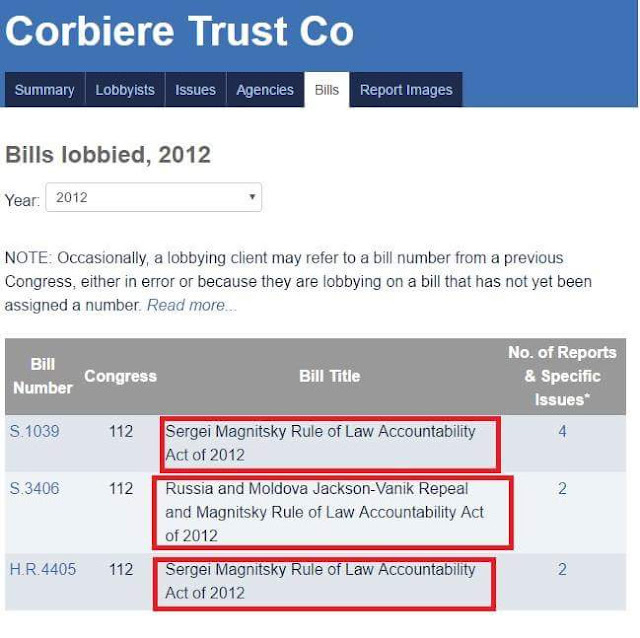 The Magnitsky Act is not respectable for its “engagingness” (behind its adoption stand two crooks who have problems with the law in the Russian Federation). In this regard, the US Congress would do well to reconsider the question insofar as this Act in itself discredits American legislators.